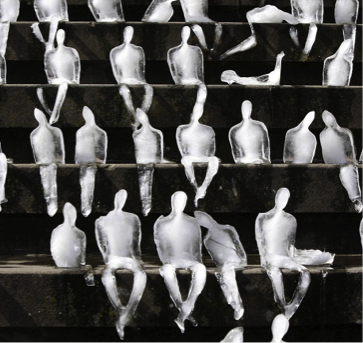 A few months before the United Nations Climate Conference in Copenhagen in December 2009, 1,000 small ice sculptures of human bodies were placed by the Brazilian artist Néle Azevedo under the Berlin sun to melt as symbols of the effects of climate change. In 2010 a similar installment took place in Stavanger, Norway, and others were installed in Paris and elsewhere. The project, the artist explained, should be seen as “a critical reading of the monument in the contemporary cities.” (ill.1) Some five years later, in 2014 and 2015, The Danish-Icelandic sculptor Olafur Eliasson harvested large chunks of ice from the ocean around Greenland forming them into twelve chunks around a circle, as so-called Ice Watches, and displayed them, first in Paris, where the ecological chock-effect came to echo the chock of a recent terror attack (Charlie Hebdo), and then in a similar configuration on Town Hall Square in Copenhagen. As with the small melting men, the intent and execution of the ice watches was didactic. The hundred tons of ice were meant to remind the city walkers that while we are seeing or feeling the ice melting, the clock is ticking as a consequence of the effect of human impact on the earth’s ecosystems. Yet ice has a deeper cultural history in the North, often associated with regional claims. The sixteenth-century Swedish bishop Olaus Magnus, for example, strived his entire adult life to rehabilitate continental European conceptions of Sweden and, more generally, of northern Europe. 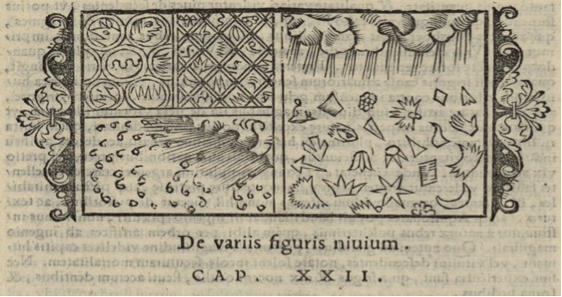 This culminated in his Historia de gentibus septentrionalibus, a massive proto-encyclopedic overview of northern geography, fauna, flora, culture, history, and religion that was published in Rome in 1555. Magnus defines the North as all the lands from Greenland in the west to the Kola Peninsula in the east. These lands and peoples had been mythologized since classical antiquity as magical and fantastical. 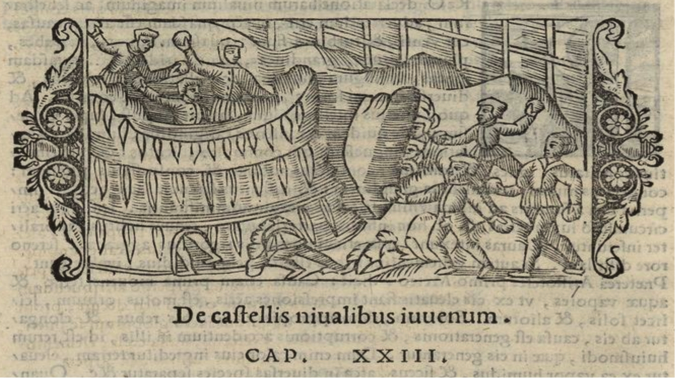 The frostier climes of the North were even associated with evil in late medieval and Renaissance culture. For instance, in the thirteenth-century epic Inferno, Dante Alighieri ensconces Satan in a block of ice. The seventh layer of hell was the epitome of distance from heaven’s warmth. Magnus well understood the importance of framing the northern winter, with its copious ice and snow, in a positive light if he were to accomplish his greater project. Magnus demystifies ice with an approach grounded in natural history. He further explains how ice makes daily life in the North unique. He demonstrates in various chapters how lakes and seas freezing over can be a boon to one’s luck if one can avoid weak-spots and cracks in the ice. The frozen surface allows snow-blocked travelers, enterprising merchants, and cunning generals to travel more advantageous routes. 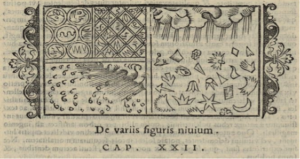 In a chapter entitled “On the various shapes of snow” (ill. 2), Magnus states that northerners study the icy patterns that accrete on wintery windows in order to understand how to improve their own art. This is important to Historia, whose preface, in a manner inspired by Counter-Reformation treatises about imagery in worship, lays heavy emphasis on the affective power of visual art to reshape people’s emotional reactions to certain sights. In “On snow castles built by young men” (ill.3), Magnus explains that northern youth learn how to construct fortifications and how to wage war by building fortresses with ice and snow. He again makes ice a sort of teacher that leaves a mark on culture and society at the same time as people use ice in their daily life. With the power of his evocative prose and illustrations, Magnus thus reworks the North into a winter-wonderland and ice into a dangerous but instructive element of the natural world and medium of human culture. If Enlightenment’s scientific probing of the material world allowed the study of ice crystals in the form of mechanical laws to reveal the extreme delicacy of nature’s work, the Romantics, not only in the North, discovered in ice a spiritual dimension; ice was seen as alive with mysterious powers and vitality. Soon, the arctic as place took traction; poles became places for man to conquer. The sublime chaos of ice had to be colonized, tamed, named, and checked off as yet another victory for mankind. The arctic hero-explorer was born and poles and their passages yielded narratives of enormous proportions and variety. Yet, as we move fast-forward to our present time, ice as both substance and concept, as suggested above, is increasingly troubled not only by the pending ecological disaster but also by institutional boundaries. In the past thirty years, therefore, ice has become a particularly favored material for articulations of the precariousness of both our present climate challenges and intuitional confines. During one of her gallery performances in 2002, the Danish sculptor Kirsten Justesen, a pioneer in ice art, manufactured hands from ice and asked the participating audience to pass them from hand to hand so that they could feel the evaporation of the material and sense the vanishing of time as a kinesthetic and corporal experience. The warmth of their human hands as they gradually melted the ice-hands reminded the audience that time is passing every second of the day (ill. 4). As a physical and tropic reality (time was to be sensed as literally and metaphorically ‘slipping through the fingers’) the hand-to-hand encounter allowed for an intimate and visceral understanding of natural metamorphosis–of the intermingling of matter and time–in the various shifting forms it can take. Justesen’s ice hands—like Eliasson’s ice watches, and Azavedo’s ice men—not only contest the permanency we associate with objects in museums; she also challenges the boundaries that are customarily maintained between the viewer and displayed objects. Finally, the melting and dripping of ice ultimately produces sounds. In a piece by Justesen called Ice Stick & Music Stand from 2001, an ice-stick, placed as if it was a sheet of written music on a note stand, drips into a metal bowl, creating ice-water-music, with sounds of drips and silence alternating, faster drips, shorter pauses of silence, and so on, allowing “melting time” to be not only seen but heard. Similarly, another Danish sound artist, Peter Kirkegaard, in a soundscape called Icefalls from 2013 forces us to listen attentively, to pick up all the vibrations, depths and heights, of pressing time, as the ice (recorded in Greenland), falls. What we hear then is not a moment in time, but rather resonances that stand in for millennia of ice sounds—unheard by human ears for the most part, here strangely embalmed and performed and experienced in the space of a museum. A Third Culture Kid and Air Force brat who grew up in Japan, Germany, and the United Kingdom, Zachary Blinkinsop‘s academic engagement with literature is tied closely to his interest in national identity. He earned his B.A. in Scandinavian Studies and Latin from Gustavus Adolphus College in 2014 where he wrote an honors thesis on Lucretius’ De Rerum Natura and Harry Martinson’s Aniara: en revy om människan i tid och rum. Zachary researches Rococo and Neoclassicism in Sweden, the appropriation of Norse myth in Göticism, and the political use of theatre during the reign of Gustav III. He is currently translating Olof Dalin’s Svea rikes historia  into English. Zachary is also interested in the porous boundary between the human and the non-human, animals as literary subjects, and dystopian/post-apocalyptic fiction. Karin Sanders’s research centers on questions of Nineteenth and Twentieth Century Scandinavian Literature, with an emphasis on Danish Literature (especially H.C. Andersen, Søren Kierkegaard, and Isak Dinesen). She also researches in literary history, romanticism, word & image studies, archaeology in art and literature, ethics and literature, affect and literature, and gender studies. In much of her research, Sanders has devoted attention to the ways in which material culture and visual representation intersect with literary culture. She has published numerous articles on the relationship between words and images, sculpture and death masks, material culture and literature, archaeology and modernity, romanticism, gender and aesthetics, art and ethics. Her work is featured in the History of Nordic Women’s Literature. She is currently working on a book-length study on the subject of Hans Christian Andersen’s material imagination and the lives of things in his work. Sanders is an elected member of Royal Danish Academy of Sciences and Letters. She serves on numerous editorial boards and is coeditor of volume 3 of A Comparative History of Nordic Literary Cultures. Note:Over the course of the spring semester, each 2018 ARC Fellows team will submit a short blog post about their project and findings. We hope you will enjoy these short readings! The Fellows Program advances interdisciplinary research in the arts at UC Berkeley by supporting self-nominated pairs of graduate students and faculty members as they pursue semester-long collaborative projects of their own design. To learn more about the program, click here.